Want to do more with your saber than saber spins? There are hundreds of videos showing people swinging their sabers, doing flourishes and performing choreographies. Using our system, you can learn how to notate any choreography whether it's based on a movie or if you want to create your own. SaberCraft provides you with online video tutorials that show you how to take that notation and apply it to your performances or practice drills. Below you'll find tutorials on single forms and duel choreographies. You must register for free in order to view the full versions of the duel choreography videos. Learning the Temporal Notation System. 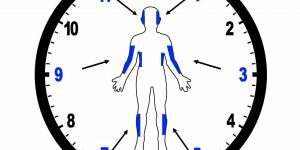 It's an intuitive easy-to-use notation system that designates targets based on the points of a clock. If you understand "1-o-clock", then you understand where to strike. Read over the notation and get a firm understanding. You can download the Notation Worksheets as PDF files. Once you understand the notation, you can begin practicing anywhere in the world as long as you have a stick or a saber. These are simple forms that have been on the internet for over a decade and provide you with proper postures on how to strike and move. These forms combine a number of moves to help you practice your strikes. Got a partner who's ready to jump in on the action already, jump directly from the Notation to Duel Choreographies. 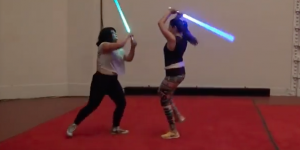 We've notated saber fight scenes inspired by movies for you to practice and perform with others. 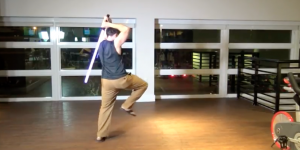 These are "full on" saber battle tutorials that most people can pick up in no time. View the notation embedded in our videos by turn on Closed-Captioning. View our video tutorials below and be the hero or villain of your choice for your next performance, party or practice! Sign up for our quarterly emails and stay up to date with all of our new lessons and exercises to take your saber choreography to the next level. We promise not to spam you but rather will update you when we have new tutorials and lessons available online. If you attend our classes already, be sure to register on our website for an account.